"Wedding Presents of a Princess"
The King and Queen of Denmark  presented their daughter with a splendid necklace in diamonds, with a cross attached; the Queen Dowager , a portrait of His Majesty, in oil painting; and Queen Victoria , a rich cashmere shawl and a medallion studded with pearls and containing a portrait of Her Majesty. The Emperor and Empress of Russia , a splendid bracelet, with five rows of large pearls and brilliants; the Dowager Queen of Hanover [7; pictured above], a necklace and bracelet of pearls, rubies, and diamonds; and the Duke of Cumberland presented his wife with a complete set of jewels, in diamonds and sapphires. The Prince of Wales  sent a magnificent Indian necklace of large pearls, raw diamonds, and emeralds; the Princess of Wales [pictured above], a traveling necessaire in silver, with embossed monograms in gold; and the children of the Prince and Princess each a bracelet set in brilliants. The Princess Beatrice , a bracelet in chiseled gold and studded with brilliants, and the Duchess and the Duke of Cambridge , a silver-gilt inkstand, a bracelet, and two silver-gilt candlesticks. The Hereditary Grand Duke of Russia and the Czarevna (Princess Dagmar) [11; pictured above], a large locket most richly set with matchless sapphires and brilliants, and the Hereditary Princess Caroline of Denmark , a breakfast service in fine Danish china, with painting representing Danish views. The Crown Prince and Crown Princess [13; pictured above with their family] presented the Duchess with a most magnificent bracelet, containing seven very large brilliants. The Dowager Duchess Wilhelmina of Glucksburg , an antique ring in diamonds, which originally belonged to the wife of King Frederick V (Queen Louise, daughter of George II) . The brothers of the king presented valuable ornaments, the ladies of the royal household beautiful embroideries, the Society for the Protection of Animals, of which the Princess is the patroness, a silver inkstand, while numerous presents, more or less costly, but all valuable as a proof of the general love and esteem in which the Duchess is held in Denmark, were received from all parts of the country. I mentioned in my letter, giving a description of the royal wedding, the impression which the magnificent toilet of the Crown Princess created on all present. I am informed that the diamonds worn by Her Royal Highness on this occasion represented a value of at least 2,000,000 crowns, or something like 125,000 pounds. On the occasion of the marriage, the Duke of Cumberland distributed the sum of 100 guineas among the charities of Copenhagen. A private Danish gentleman spent about a similar amount in providing bread and meat to the poor, so that, as he stated, on this happy occasion no poor should want a good substantial supper. 1. Princess Thyra of Denmark (1853-1933) was the fifth child of King Christian IX and Queen Louise of Denmark. She was also eventually the sister of the King of Denmark, the King of Greece, the Empress of Russia, and the Queen of the United Kingdom. Her life was a bit scandalous; when she was a teenager, she had an illegitimate daughter with an army officer. The baby, Kate, was given up for adoption shortly after birth. 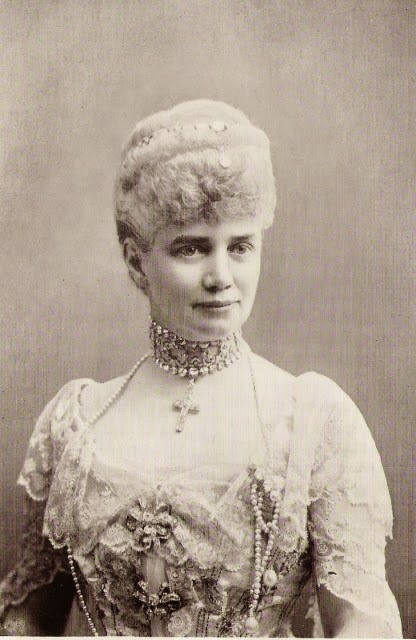 Thyra married the Duke of Cumberland in December 1878, and the couple had six children. 3. King Christian IX (1818-1906) reigned in Denmark from 1863 until his death. His queen was Louise of Hesse-Kassel (1817-1898), who was herself the daughter of a Danish princess. 4. Queen Caroline Amalie (1796-1881) was the widow of King Christian VIII of Denmark. She was the country's dowager queen for three decades. 5. Queen Victoria of the United Kingdom (1819-1901) was the groom's first cousin once removed. 6. At the time of the wedding, the czar of Russia was Alexander II (1818-1881); his consort was Marie of Hesse and by Rhine (1824-1880). Their son, Alexander, was married to Thyra's sister, Dagmar. 7. The groom's mother, Marie of Saxe-Altenburg (1818-1907), was the widow of King George V of Hanover. 8. The future King Edward VII of the United Kingdom (1841-1910). He was a second cousin of the groom, and his wife, Alexandra of Denmark, was the bride's sister. Ernst August and Thyra met in 1875 while they were each visiting Bertie and Alexandra at Sandringham. 9. Princess Beatrice of the United Kingdom (1857-1944) was the youngest child of Queen Victoria (and therefore also a second cousin of the groom). 10. The Duchess of Cambridge (1797-1889) was the daughter-in-law of King George III of the United Kingdom and the great-aunt of the groom. As she was born Princess Augusta of Hesse-Kassel, she was actually also the great-aunt of the bride. The Duke of Cambridge mentioned here is her son, Prince George (1819-1904), who was born and educated in Hanover. 11. The heir to the Russian throne at the time of the wedding was Alexander (1845-1894), who would later become Alexander III. He was married to Thyra's sister, Dagmar of Denmark (1847-1928), who used the name Marie Feodorovna after she married into the imperial family. 12. Hereditary Princess Caroline of Denmark (1793-1881) was the elder of the two surviving daughters of King Frederik VI of Denmark and his queen, Marie of Hesse-Kassel. She was also the widow (and first cousin) of Hereditary Prince Ferdinand of Denmark. 13.Thyra's brother, Crown Prince Frederik of Denmark (1843-1912), was married to Princess Lovisa of Sweden (1851-1926). 14. Wilhelmine Marie of Denmark (1808-1891) was the younger surviving daughter of King Frederik VI, and the younger sister of Hereditary Princess Caroline. She was the widow of the Duke of Schleswig-Holstein-Sonderburg-Glücksburg. 15. Queen Louise of Denmark (1724-1751) was the daughter of King George II of Great Britain and the wife of King Frederik V of Denmark. She was the great-grandmother of the Dowager Duchess.